The Omega-3 stabilized ground flax seed supplement - made with stabilized and freshly milled flax - to help maintain a shiny healthy coat, strong solid hooves, and top performance - for horses in all life stages. Omega Fields provides the best stabilized ground flax that is stabilized using our proprietary flax stabilizing technology. Dry scaly itchy skin, joint pain/inflammation, poor hoof growth, allergies, pregnancy, etc. may indicate a deficiency of Omega-3 essential fatty acids in the diet. 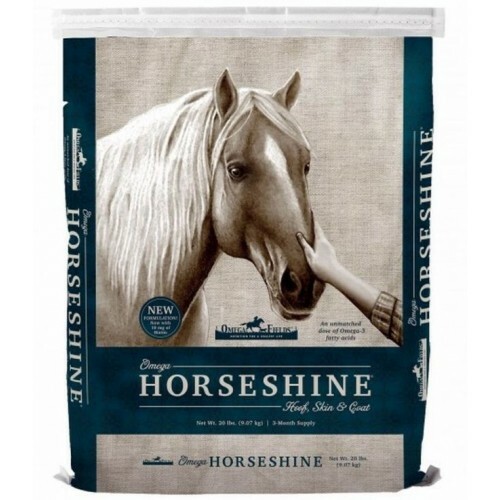 To overcome these deficiencies the horse may need to get an increased serving size (up to 2 to 3 cups) of Omega Horseshine® every day, short term. All natural formula without artificial preservatives. Start gradually to suggested minimum daily serving of ½ cup 1/8 cup on first and second days, ¼ cup on third and fourth days, then 1/2 cup on fifth day. Thereafter, increase as desired. Short term upload amount is 1 cup to 3 cups daily for 1000 to 1200 lb. horse (adjust upload amount proportionally up or down per weight of horse).